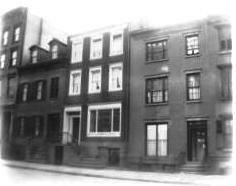 By the 1830s modest brick homes were being erected along West 10th Street between Fifth and Sixth Avenues. Among them was the home of Owen Crosby at No. 58, built in 1836. Unlike its Federal-style next door neighbor at No. 56 built four years earlier, the Crosby house sat far back on the lot. About twenty years later a three-story Greek Revival home was built at the property line, hiding the original little house in what was now the back yard. The same year that the little Crosby house was built, David Maitland Armstrong was born in Newburgh, New York. The boy would go on to an astonishingly varied career and celebrated life. After graduating from Trinity College in 1858 Armstrong practiced law in New York City. In December 1866 he married Helena Neilson, the granddaughter of Nicholas Fish and a direct descendant of Governor Peter Stuyvesant. But the attorney had a creative side and a year later he traveled to Paris where he became the first pupil of artist Luc-Olivier Merson. For two years he shared a Paris apartment with a roommate—Augustus Saint-Gaudens—before leaving for Rome to continue his studies there. In 1869 he was appointed the United States Consul to the Papal States; but upon returning to the States in 1872 his passion for art was reignited. Around the same time Armstrong and his wife purchased the little three-story house at No. 58 West 10th Street. The artistic block appealed to the artist—by now Armstrong was achieving his own reputation for his stained glass and mosaics. Across the street lived John LaFarge and towards Fifth Avenue was the home of Mark Twain. The little house in the rear had previously been the Tile Club—a meeting place for thirty-one eminent artists and architects. Included in the club were Stanford White, Winslow Homer, Edwin Austin Abbey, William Merritt Chase and Armstrong’s former roommate, Augustus Saint-Gaudens. When the club disbanded, Armstrong bought the property. It was good friend and club member Stanford White who transformed the old home and enlarged it; adding a one-story addition to the rear that connected it with the Crosby house. The result of his handiwork is an interesting mix of periods and styles. The Greek Revival inner door frame was retained; yet a Federal style leaded overlight and sidelights were added. The outer entrance frame was replaced with one more in the Federal style with delicate applied swags and cattle heads. The same treatment was carried on to the large, tripart window at the first floor. D. Maitland Armstrong took the opportunity to show off his glass-making skills. He designed the lovely stained glass window of the first floor—containing over 400 panes--and the delicate staircase skylight inside. Throughout the house Armstrong’s stained glass panels became part of the architecture. D. Maitland and Helen Armstrong had six children in the three-story house. Through the years much of the entertainment here centered around them—debutante and wedding receptions among them. The children’s later lives would reflect their early years surrounded by some of America’s most eminent writers and authors. At the time of his death three of his children were already involved in the arts. Helen Maitland Armstrong was a junior member of Maitland Armstrong & Co., a stained glass company founded by her father; Margaret was well known as a magazine writer and illustrator; and Lieutenant Hamilton Fish Armstrong, who was with the 22nd Infantry at the time, was a known poet and writer. While she witnessed many of her children’s achievements, she would not see their ultimate successes. Margaret had been an illustrator for popular magazines such as the Century and Schribners and designed numerous book covers. Prior to 1915 she spent several years in the Far West camping, hiking and studying native plants before collaborating on a book of western American wild flowers. Then, at the age of 70, she wrote her first biographical novel, “Fanny Kemble: A Passionate Victorian.” She was suddenly a best seller and wrote another biography and several mystery books. By the time of her death in the house at the age of 76 in 1944 she had established herself as a first-rate author. In the meantime her sister Helen was well-known for her stained glass windows, which The New York Times deemed “exceptional.” She designed and executed windows for the chapel at Sailors’ Snug Harbor on Staten Island, a memorial chapel for Mrs. O. H. P. Belmont in Woodlawn Cemetery, for the All Souls’ Protestant Episcopal Church in Biltmore, North Carolina, and the Roman Catholic Church of Our Lady of Perpetual help in Bernardsville, New Jersey to name but a few. She died in the 10th Street house of pneumonia on November 26, 1948. She was 79 years old. None of the siblings was more accomplished than Hamilton Fish Armstrong. The founder and editor of the highly influential quarterly periodical Foreign Affairs, he established personal ties with world leaders. 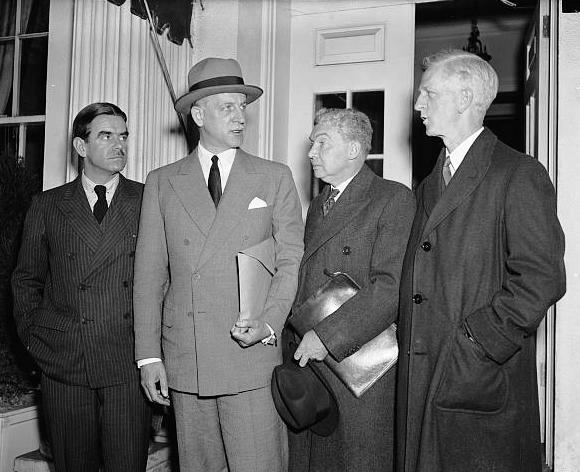 He was able to convince leaders like Leonard Trotsky, Nikita Khruschev, Franklin D. Roosevelt, John F. Kennedy, Marshal Tito, Nehru, Konrad Adenauer and Gamal Abdel Nasser to write for or be interviewed by the magazine. In 1933 he interviewed Adolph Hitler and a year later published “Europe Between Wars?” detailing his prediction of a forthcoming war. But his warmest publication was his 1963 “Those Days” in which he remembered growing up in the brick house on West 10th Street and playing “bicycle hockey” on the block. In 1987 New York University announced that the house that had been home to the Armstrong family for nearly a century would be purchased by the Alexander S. Onassis Public Benefit Foundation. The intentions were to renovate and maintain it as the Onassis Center for Hellenic Studies. As renovations were underway, fire erupted on January 3, 1989. Although the upper floors and roof were damaged, David Maitland Armstrong’s irreplaceable windows were unscathed except for the skylight. Architect David Paul Helpern forged on with the renovation, keeping the architectural importance of the structure well in mind. 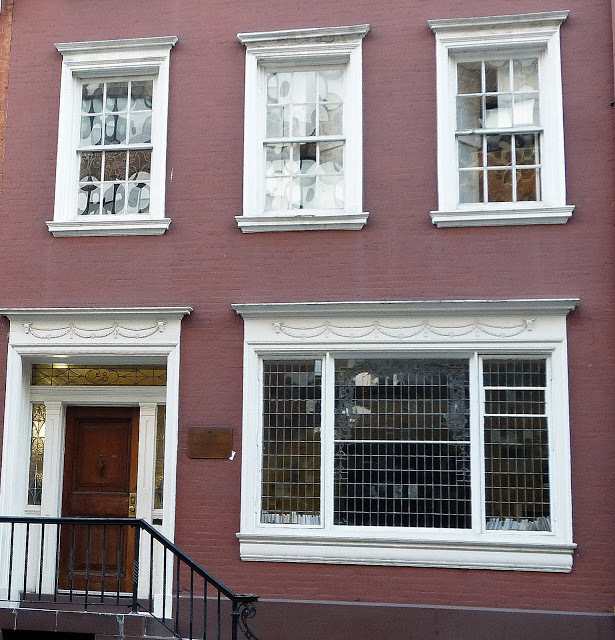 In 2007 the house became the center for New York University’s Creative Writing Program, supported in large part by Lillian Vernon. The house is the setting for readings, panel discussions, lectures, seminars and other literary functions. The creative collaboration of D. Maitland Armstrong and Stanford White survives beautifully intact on one of New York City’s most charming and architecturally-interesting blocks. Great story! Thank you for writing this!